A happy selfie in front of Water Tank Hollow Falls along the 62-mile Pine Creek Rail Trail - a trail that didn't exist when the Mid-State Trail was routed through the same area. Blame the lady at R.B. Winter State Park. It was a miserable, cold, foggy, drizzly day. I took a break from hiking, soaking wet from the pants pockets down after plowing through overgrown trail for five miles, and stopped in at the park office to ask for a map of Tiadaghton State Forest, which I was going to be hiking through in coming days. The nice lady dug out the requested map and handed it over. She also produced a map of Pine Creek Rail Trail. "It has the Mid-State-Trail marked on it too" she explained helpfully. 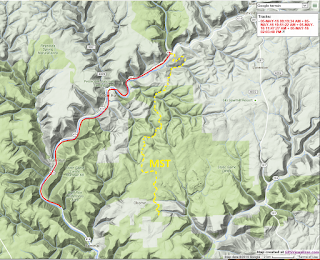 I thanked her for her time, stuffed the Pine Creek map in my pocket as I left, and thought little more about it. For the next three days the weather did not relent. 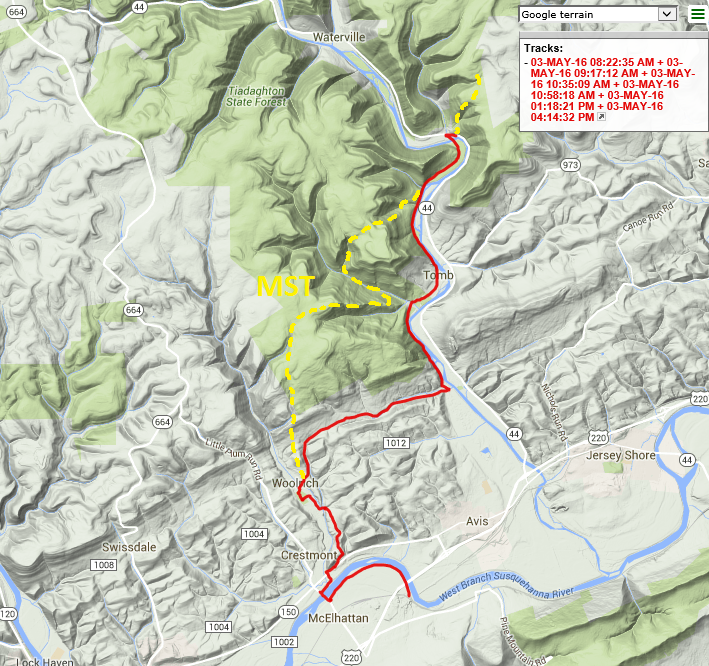 I hiked the Mid-State Trail over Hill and Dale in fog with drizzle and occasional rain. It was becoming painfully obvious that the MST went honking up and down severe slopes one after the other. 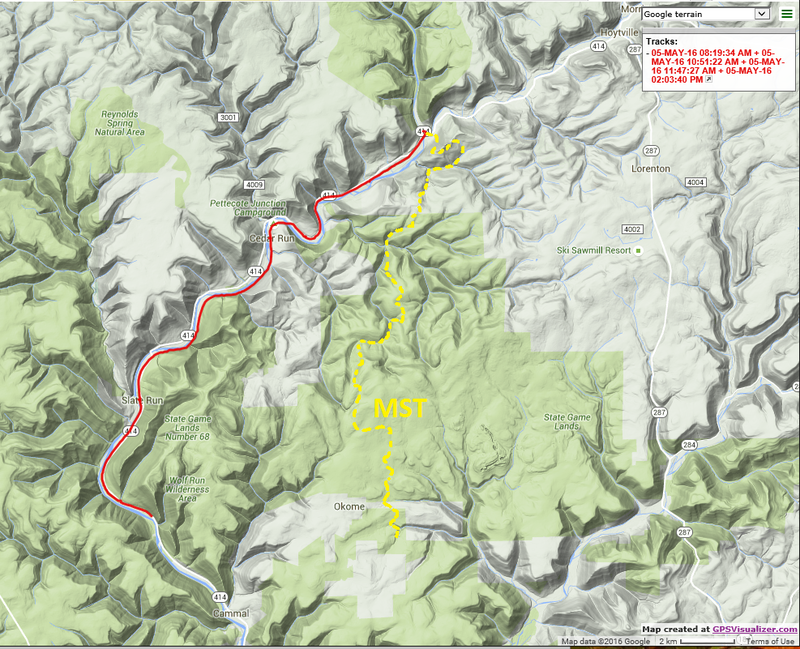 Sometimes it was to avoid private land, most times it was just to route a north-south trail through east-west ridges and valleys. Some of these may not technically be PUD's (Pointless Ups and Downs), but they all felt pointless after a while. Meanwhile the dripping wet outreaching twigs and ground cover began to haunt me until I was cursing under my breath. When it wasn't raining, the damp fog kept the foliage from drying. The temperature rarely got out of the 50's for two weeks. It was miserable every day from start to finish. Then the day came that I crossed the West Branch of the Susquehanna and came into the town of Woolrich. It's a gorgeous town, even on a cold gray day. The town is built around the mills where they made good old fashioned mountain clothing back when it wasn't old fashioned - starting in 1830. The street into town is lined with century-old Norway Spruces the way other towns used to have elms. I stopped in the spacious town park (the trail meanders through it in a big arc) and got out my trail map. 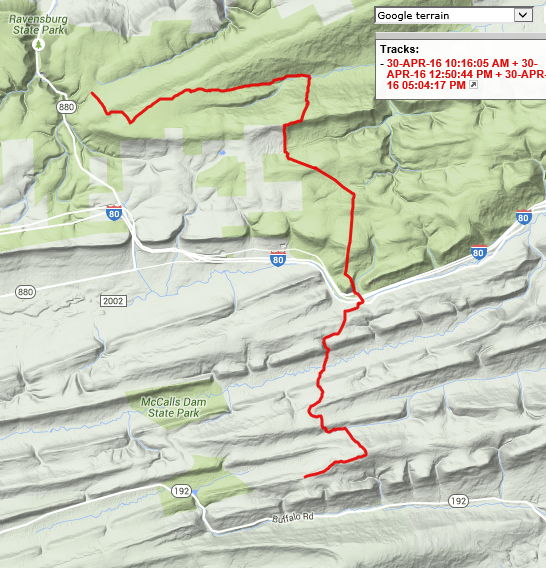 I noticed that my next leg on the Mid-State Trail would honk up to a ridge, then plunge down to Pine Creek and meet the Pine Creek Rail Trail near its southern Terminus at the wonderfully named town of Jersey Shore. Hmmmmmm. Pine Creek Rail Trail. I dug out the map that the dear lady at R.B. Winter Park gave me and looked it over. 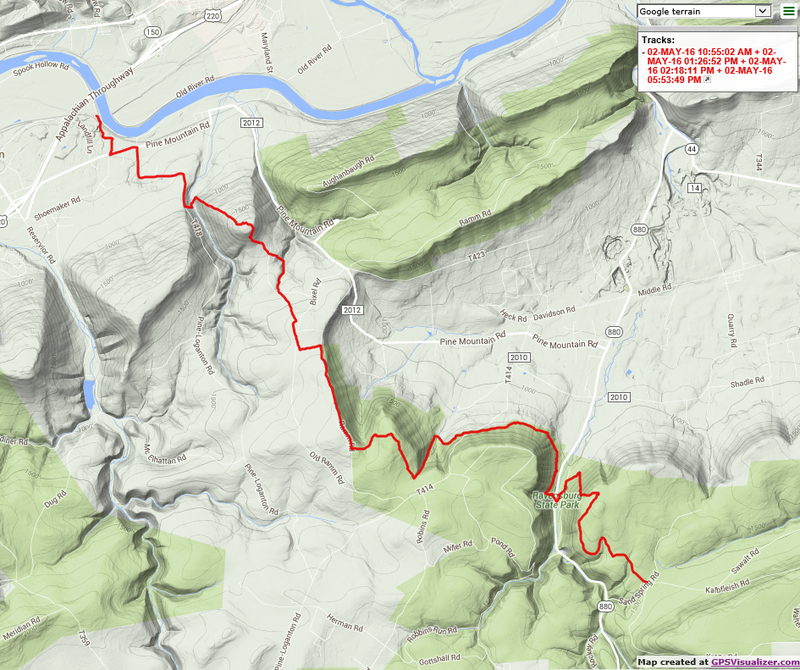 "A 62-mile, gently graded, graveled path that winds through the spectacular Pine Creek Gorge" said the brochure. 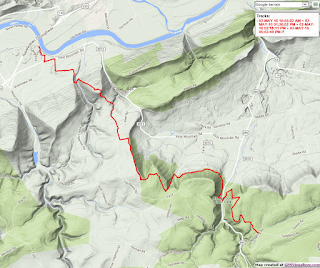 This is the Grand Canyon of Pennsylvania - a major natural landmark in the state. The Mid-State Trail barely grazes it in two brief encounters. It was a working railroad back when they laid out the trail. Who could blame them for avoiding it. But that was then. And this is now, with a forecast promising more rain and cloud and drizzle for the foreseeable future. I went to school at Penn State, so I know that this part of the world can sometimes go for weeks without seeing the sun. While I was at Penn State I flew with a pilot friend from University Park airport to Wellsboro and got a first hand look at the Grand Canyon. That was a cloudy damp day too, back in Fall, 1969, and I remember how the damp moss seemed to be drinking in the moisture at the waterfall we visited during our brief ground stop. I studied the maps in more detail, surprised to see that the two trails cross each other twice, and coincide for short distances in both places. The two trails both go south to north. One takes a dozen or more PUD's. One is 'gently graded'. One takes you stumbling over jagged rocks and trudging through knee-deep growth that crowds in over the foot path. One is a ten foot wide 'graveled path'. One follows mountain ridges and high ground most of the time. One follows the river (much too wide to be called Pine Creek) for Sixty Two miles. I remember how much I craved walking beside a noisy rushing river when I hiked the Appalachian Trail and got a scant few miles of it along the Housatonic in Connecticut. Pine Creek is just such a river, and it has exactly a bazillion and six tributary side streams, each with lovely mossy waterfalls cascading down the sides of the gorge. Waterfalls are the one natural feature I love more than any other. Click. 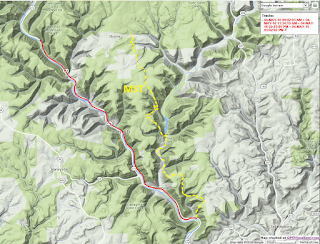 I left Woolrich by road, skipping the PUD and making a bee line for Pine Creek. I was on the rail trail by the end of the day. It was the right choice. It continued to rain daily. The temperature never got out of the 50's. 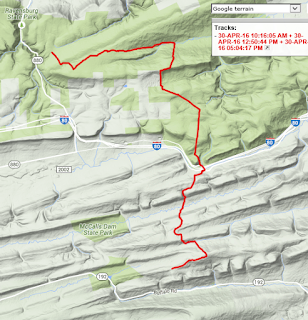 But I remained dry as I walked the length of Pennsylvania's Grand Canyon via the insider's route--the Pine Creek Rail Trail. I didn't miss a waterfall. If the MST took me to views I would have seen fog. Here are a few of the highlights, starting with another of the best waterfalls. The old trail to this one is virtually unused. The secret waterfall on a tributary of Pine Island Run. A weeping mossy wall with trail lined with uniform age sycamores, river almost always in sight. Cedar Run Trestle - most impressive of the half-dozen steel bridges. West Branch of the Susquehanna where the trail crosses it at McElhattan. Note the dreary weather. A Red Eft - juvenile form of the Eastern Spotted Newt. The rain brought them out in numbers. During an hour or two of partial sunshine I had this amazing view of a bowl-like valley that reminded me of Burke's Garden in Virginia--the valley that was Vanderbilt's first choice for Biltmore, but the owners refused to sell to him at any price. 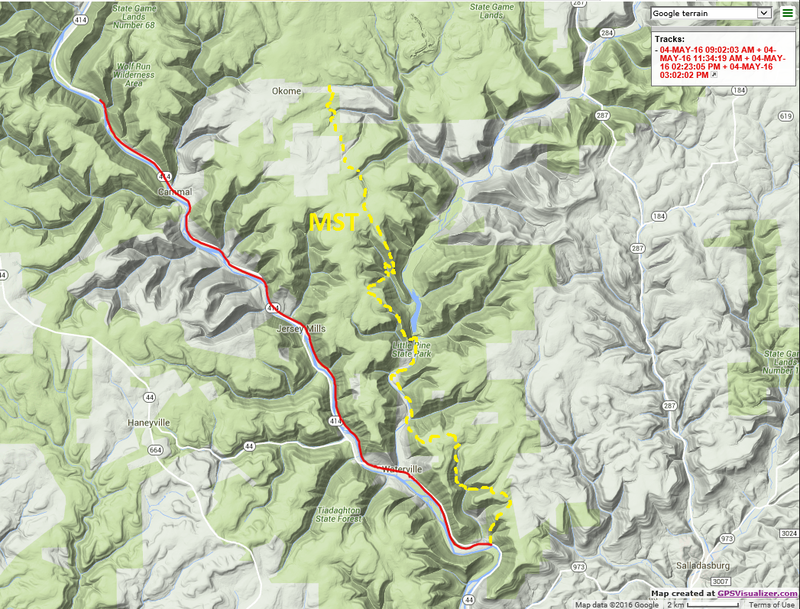 MST uses less than a quarter mile of this old hand-built trail. Even the fog couldn't mask the quality and hard work that folk put in here. 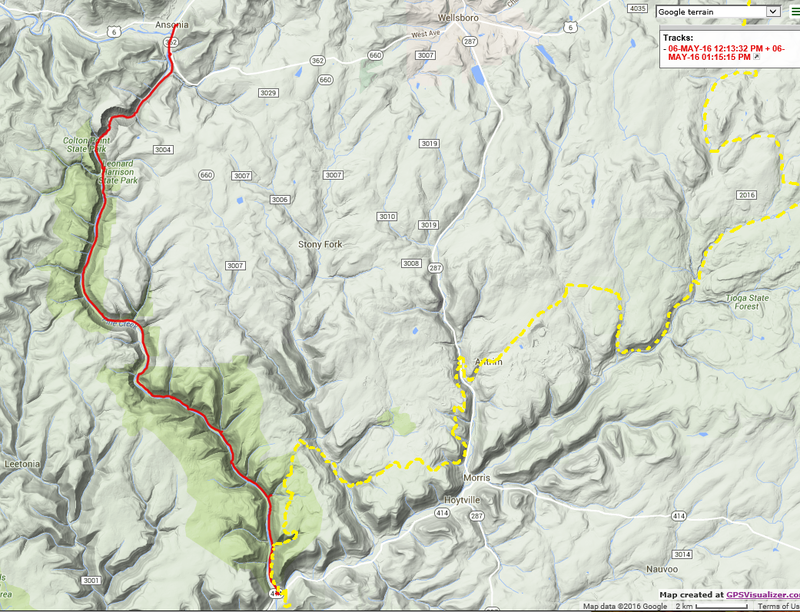 Now, for the record, here are the six days of GPS tracks, not interactive, just screen shots. 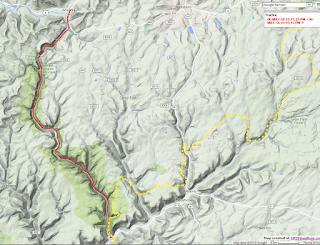 Where I deviated from the Mid-State Trail its route is drawn with a yellow dashed line. And that is where I hiked and what I saw. I'll be back on the MST briefly and then crossing the state line into New York. Best of all the forecast seems just a bit better ahead.